Hello and a good day to all… we hope you are able to get out and enjoy it. Or stay in and enjoy it, whatever your preference. Today we bring you another example of the as-yet-to-be-named viral infection sweeping Manhattan. Likely an airborne virus, this mutant strain appears to take over writers’ and editors’ thought processes, frequently resulting in columns on “How to Be Preppy.” Our latest example comes via this column at website Complex, a site TP visits every now and again for research purposes only. Honest. In explaining how one accomplishes Prepdom (our word), Complex awards Band of Outsiders its designation as “The Brand,” presumably “the” preppy brand. 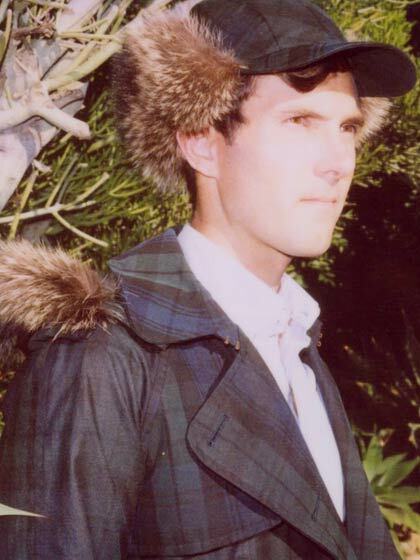 Above we show the apparel and accessories illustrating Band of Outsiders’ designation as “The Brand”: their trenchcoat in a Blackwatch plaid, accented by the ‘trapper hat’ trimmed with raccoon. Below, our selection of this look with David Beckham in the company’s cashmere tartan sweater vest. The rapid spread of the virus shows no signs of abating; we hear it is frantically being tracked by the CDDC (Centers for Design Disease Control) in an effort to maintain some, any sartorial standards. Below, our selection of Penn Badgely in a Band of Outsiders’ blazer and grosgrain wrapped loafers, from GQ’s August issue. Many readers not ‘sur intime avec’ Band of Outsiders may remember them for their collection with Sperry Topsiders that debuted this past spring, the company’s first collaboration with an outside entity. … as well as The Tie and The Shop (if you recognize the photo below, please award yourself ten extra Preppy Style Points, a currency we regret to inform you that is utterly without foundation or value, other than our holding you in the highest of esteem). Now, you know exactly where this is going: The Shoe (of course), The Restaurant (appropriately situated on the UES,) and more. We must stop at this point to provide readers with full disclosure: we actually adore much of what Complex publishes, and quite love this little treatise as well, so there, our secret is out. We hope you don’t think less of us. Great post! Not sure if Complex is on target, but they get an “A” for effort! Hmmm…..interesting. I don’t like that giant logo on the cashmere coat though, what about you? the fur looks weird on that jacket. But I do generally like Band of Outsiders. and yumm, gimlet! David Beckham – sort of hot, used to be better. Definitely not preppy though. He has gone tattoo mad, and bless him, poor boy, has trouble speaking. Super charmng though. Great Bod. Must stop this line of conversation! David Beckham is hotter without Posh on his arm. Also, Hendricks ROCKS. I have featured it in a few different 5:00 Fridays posts on my blog, Dirt & Noise. I am a big fan of Band of Outsiders…great cashmere hats at Barneys!